Warrior Filtered Cigars offer cigarette smokers a low-cost alternative smoke packed with premium tobacco and superior taste. 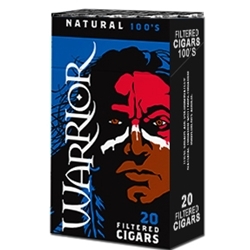 Warrior Filtered Cigars are iconic, with an eye-catching package that boldly tells consumers: "Welcome to Warrior Territory, where smoking costs far less". Each of these discount filtered cigars are Native American made, infused with all-natural US grown premium tobaccos wrapped in natural tobacco paper and capped off with longer filters. Once ignited, a Warrior Filtered Cigar allows for a slow elegant burn giving off a rich full-bodied sweet flavor and aroma that is true to traditional smokes. Every day smokers are switching to filtered little cigars not just for their great inexpensive prices, but for their quality and superb taste. Warrior Filtered Cigars offers an excellent choice for your smoking needs. Smokers Discounts has made it easy and affordable to buy filtered cigars online. Call us for more details!